Nestled in the trees overlooking rolling waves from your private beach is this custom-built home rising high to the Gulf of Mexico shore. Thoughtful dcor and architectural design capture the eye, creating comfortable gathering spaces. The pool and spa, keenly situated between the home and guest house, is wrapped by an extensive terrace, extending up to an outdoor kitchen and more spaces to take in the serene views. Double doors open the home to a cozy foyer with herringbone patterned flooring and immediately to the office/library with heightened wood bookcases. The family room offers an intimate sitting area with built-in banquet and 28-foot ceilings of tongue-and-groove wood. The true heart of the home is the kitchen centered between the family room and dining room, boasting a 16-foot black granite island, elements of pine, cherry and distressed painted wood cabinets complementing the glass tile backsplash and farmhouse sink. A bright dining room, with glass French doors leading to the terrace, brings the beach views inside, while grand windows flood the living room with light and panoramic ocean views. Completing the first level is the master suite with terrace access and two individual bathrooms. The second level provides an additional master suite with private balcony and en-suite, and two bedrooms with private baths. A three-stop elevator takes you to ground level to your personal waterfront sanctuary. 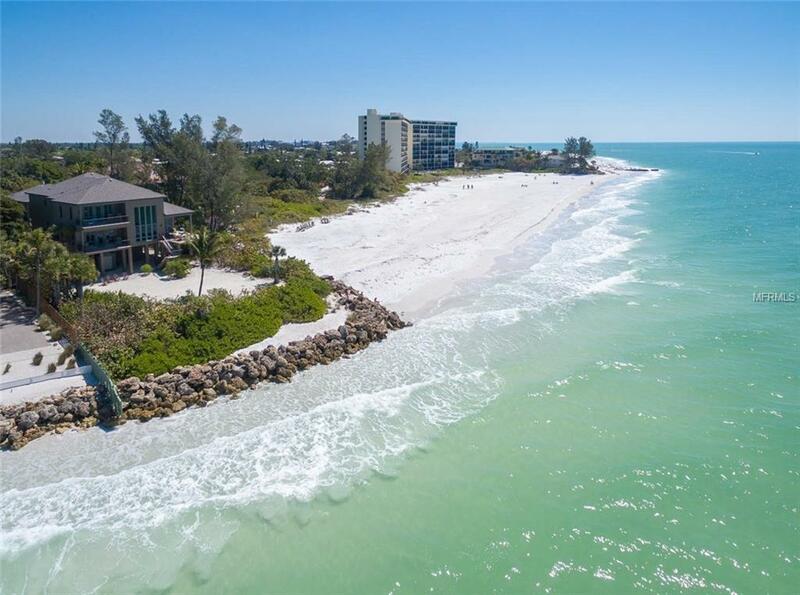 All this within walking distance to the village and a short drive to downtown Sarasota.